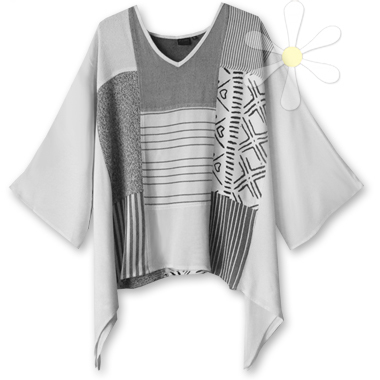 Unique combinations of various susti prints and textures get top billing for charm on this impossibly soft garment! It's made of the highest quality susti, loomed in Morocco and as yummy as cashmere. Like so many of our global styles, this is both classic AND unique! The intricate piecing, which will vary on each garment, reminds us of those gorgeous marble intarsia inlay mosaics seen all over the world from the Taj Mahal in India to the Alhambra of southern Spain. Some refer to this style as "nothing matches" but we say nothing matches better than this! Be authentic... be your fabulous self every day!